This Google Map from the the Oregon Department of Geology and Mineral Industries shows tsunami evacuation zones for the Oregon coast. The map allows those who live or work in Oregon to search the map to see if they are in an area where special actions should be taken in the event of a strong earthquake. 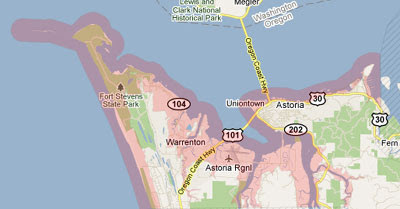 The map overlays custom map tiles on Google Maps to show tsunami evacuation zones in Oregon. It is possible to search the map by address, zip code or coastal area. The site also gives tsunami safety advice explaining what you should do if a strong earthquake occurs. This new Smirnoff & Time Out iPhone app is a great tool for planning your social life in London. Every day Time Out editors add the best gigs, events, bars, restaurants, club nights and essential film releases to the app. You can use the app to plan your nights out, see what your friends are doing and even order tickets. The application uses Google Maps to pinpoint your location and show you Time Out recommended activities nearby, complete with event previews.The application is a really useful tool for Londoners and I'm sure that if it proves popular Time Out will extend the service to other cities. BNE Traffic is an iPhone application that displays traffic incidents around the greater Brisbane area using information from hundreds of Twitter users using the #bnetraffic hash tag. The application uses Google Maps to display information about current traffic conditions. The markers on the map show where traffic obstacles have been identified. As its name suggests, Stalqer is an iPhone application that will let you follow the movements of other people without their express permission. Stalqer connects to your Facebook, Twitter and Foursquare accounts and can display a Google Map of your friends based on their location sharing on those services. Stalqer can grab location data from (public) Facebook profiles, geo-tagged Tweets and from Fousquare. Atlas Obscura calls itself a "compendium of the world's wonders, curiosities and esoterica". The site itself is definitely wonderful and is a great resource of strange and interesting places and objects around the world. Navigating Atlas Obscura is also a joy. The site can be navigated by category and by location and each curiosity has links to related wonders and to nearby places. Each of the site's listings includes a Google Map that shows the location of the listing and also includes markers of nearby curiosities. 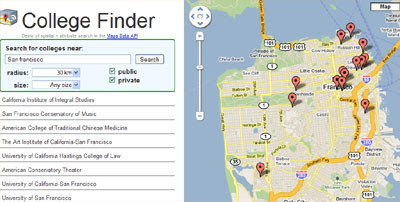 Potlocator allows you to enter a zip-code and view the locations of the nearest marijuana dispensaries on a Google Map. 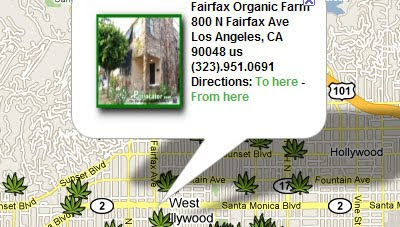 Dispensaries are shown on the map with marijuana leaf shaped markers. Clicking on a marker opens an information window with the name and address of the dispensary and the option to get driving directions. The results of a search are also displayed beneath the map, where distances from your searched location are displayed and telephone numbers are given. Tobias Friedrich of the Max Planck Institut has used custom map tiles with the Google Maps API to display a number of large rotor-router aggregations. "Given an arbitrary graph, a random walk of a chip is a path which begins at a given starting point and chooses the next node with equal probability out of the set of its current neighbours. Random walks have been used to model a wide variety of processes in economics, physics, medicine, and mathematics." That explanation doesn't help me much, but the maps sure are purty. Gmap4 is a Google Maps based viewer for detailed topographic maps of the USA and Canada. Gmap4 can read and display GPX and KML files and comes with a detailed help file and a ‘Quick Start’ guide. This map shows most of the USA and Canada. To view the topographical map open the menu in the upper right and select MyTopo. In addition to KML files and GPX files, Gmap4 can now also read Google MyMap files. The Gmap4 Help file contains step-by-step instructions for placing a KML file online by saving it as a Google MyMap. This is an easy and free way to place a KML file online so it can be viewed by Gmap4. The topographic map tiles displayed by Gmap4 come from MyTopo via their API. If you want to use the MyTopo tiles yourself with the Google Maps API, then this post by Chris Schneider (to the Google Maps API Google Group) should be of help. 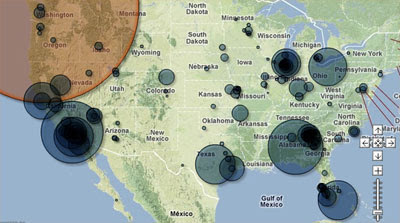 This interactive Google Map shows information on enforcement actions and cases from 2009. The map shows facilities in the United States where the EPA concluded an environmental enforcement action between October 1, 2008 and September 30, 2009. The map includes civil enforcement actions taken at facilities, criminal cases prosecuted under federal statutes and the U.S. Criminal Code, and cases in which the EPA provided significant support to cases prosecuted under state criminal laws. 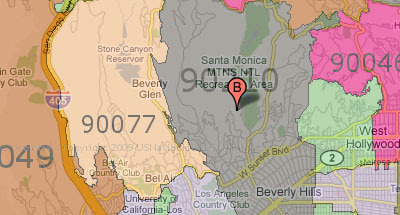 It is possible to select air, water, land and criminal enforcement actions to view on the map. Clicking on a map marker opens an information window containing additional information about the environmental enforcement case. This Google Maps mashup should prove very useful when you need to give someone directions or you want to show someone something on Google Maps. Using the site you can guide your friends around places you know using Google Maps, Street View and live chat. Once you have set up a chat room the map state is synchronised across the different users, so if you move the map the other members of the chat room will see the same map movements. The chat application even has a video option, which means users can use their webcams to broadcast live video chat whilst sharing information on Google Maps. 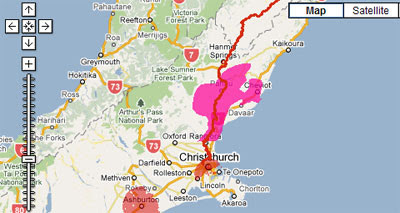 The National Broadband Map uses Google Maps to display broadband coverage in New Zealand. Broadband supply in the country has been identified in conjunction with New Zealand's network providers and telecommunications operators. Users of the map are able to select any of the country's network providers to see where they provide coverage. Demand points for the health, education and government sectors can also be displayed on the map. Organisations and individuals can also use the map to submit their broadband requirements. The National Broadband Map includes dynamic URL generation so it is possible to link to any view on the map. It is also possible to download data from the map in KML, CSV and XML formats. Earlier this month the UK Met Office released a data set showing the monthly average temperature values for over 1,500 land stations, in some cases going back over 300 years. Geo.me has produced a Google Map mashup that allows you to view the data for all of the 1,500 land stations around the world. If you click on any of the land station map markers on the map you can view data, including the location, nearby stations, current weather and a plot of monthly average temperatures. 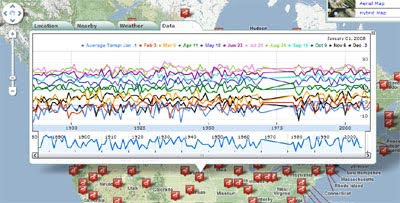 Geo.me have also produced a Climate Trends Google Map that illustrates the average temperature data for a location for a selected month and year. Controls above the map allow the user to to change the time period and the display properties of the map. Near-a-Point is a real estate website that shows the location of Craiglist and Google real-estate listings on Google Maps. It is possible to search the map by location, number of bedrooms and by cost. It is also possible to add a reference point for your search, so that you can find the distance and travel times of listed properties from a defined location, e.g. a work-place or school. The site shows the Street View of the property, where available, and photographs of the property. Each property also comes with a link to a crime report for the neighbourhood. If you are interested in creating your own Twitter Map then this article on the woorkup website should prove very useful. The article explains how to use the Twitter and Google Maps APIs to create a map showing Tweets within a defined distance of a location. The location of Tweets is determined by Twitter's new Geotagging API, but will also fall back on the location given in Twitter profiles, if no location is available from the Tweet. The article includes a demonstration map that displays 25 Tweets on a Google Map. If you want to create a Twitter map that only displays Tweets containing a specific search term it is possible to add a query to your call of the Twitter API (e.g. add "&q=olympics"). Now with just a little tweaking of the demonstration map you should be able to create your very own TwitterVision, #UKSnow or Trendsmap. The Official NORAD Santa Tracker is now live. So for the rest of Christmas Eve you can follow Santa's journey around the world live on Google Maps. Where Do You Go? allows Foursquare users to create a heat map of their travels. Once you log into the site with a Google account and then authenticate with Foursquare you can create a heat map that visualises your location data using color on Google Maps. 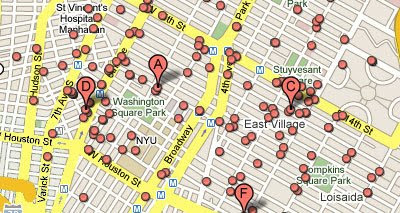 Denser concentrations of color on the map indicate more Foursquare check-ins at a venue at that particular location. SocialGreat is another mashup using the Foursquare API and Google Maps. The site uses data from Foursquare to show what are the current most popular places in cities and uses the Google Maps API to show where those places are. SocialGreat tells you which bars, restaurants and hot spots in FourSquare cities are "great" according to a near real-time feed of "social" location data from Foursquare users. You can use the map to check which spots are the most popular this hour, day, week, or month. Peek Maps is a free embeddable widget that shows your recent location on a Google Map and can be placed into a web page, blog, or sent as a link and shared with whoever you want. If you are a Foursquare user, you can have your recent check-ins appear on your Peek Map. Ul.timate.info is a FireFox add-on that allows you to check-in to Foursquare from any computer using IP and wifi based location services. When you run the add-on the first thing that will appear is a Google Map of where you are. You can then update Foursquare with you location as well as your Facebook, Myspace, FriendFeed and Twitter accounts. In July the Google Maps API for Flash introduced the Map3D object which allowed developers to present a 3D view within Google Maps mashups. Surprisingly I haven't seen many maps that have used the new 3D perspective. StreetSounds is the first mashup I have seen for while that has used the Map3D object and to do so to such good effect. The StreetSounds map is an interactive tool for sharing and listening to sounds from all across the United States. The map allows users to upload sounds and discover sounds you have never heard before. Using the map you can listen to the sound of places you've not visited or relive memories from those you have. The sounds range from a Berkeley student demonstration and a bustling intersection to an arguing couple and a band rehearsing. As well as the StreetSounds map a competition is also set to be launced, challenging film makers to create films based on the sonic landscapes of cities. The films must use at least three sounds from the Sound Map and be 3:00 min or less in length. Furnished Homes is a Google Maps mashup for furnished vacation rentals in Tucson, Arizona. It is possible to search for homes by price, location and number of bedrooms. It is also possible to search for rentable properties that have internet access and that have handicap accessibility. The map includes a red marker that you can move anywhere on the map. It is then possible to roll over any of the listed properties on the map and discover how far they are from the marker. This is a really neat and handy feature. For example, if you are visiting Tucson for a couple of days for work, you can place the map marker on your work place and then find the distance away of all the possible vacation rentals. Basic listings on Furnished Homes are free, so if you have a furnished rental in Tucson you can add it to the map. Adidas have produced a fun application that lets you take over the Star Wars Death Star and blow up your friends' houses on Google Maps. The application starts with a Star Wars type credit sequence and some sequences from the movie mixed together with your location detected by Google Maps. Once the movie sequence has run your location is then shown in Google Maps satellite view being hit by an adidas logo shaped laser blast. Once you have destroyed your own location you can then use Facebook Connect to blow up your friends' houses and send them a link to your destruction. To blow up a friend's house you just need to centre the Google Map (or use the location search to find it). You can then e-mail them a link or send them a message on Facebook. The application has been developed to promote the adidas original Star Wars collection. Here are the top 10 posts on Google Maps Mania in 2009. These are the ten posts that received the most traffic in 2009, in descending order. In April the world suffered an outbreak of Swine Flu maps. This post from the beginning of May looks at over 20 Google Maps mashups that attempted to track the spread of Swine Flu around the world. The Station Fire in California caused a huge amount of damage and led to the evacuation of over 4,000 homes. Unsurprisingly there was a big spike in traffic from people searching for maps of the fire. 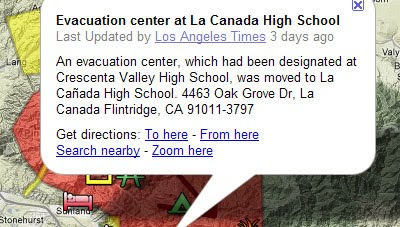 The LA Times produced one of the best and simplest maps of the fire using Google My Maps. The release of Street View in the UK was a huge media event. Google Maps Mania saw a huge spike in traffic for this post, this was possibly down to the fact that it was one of the most linked to posts of the year. In April Dual Maps released a tool that allows anybody to make an embeddable map that includes a Google Map, a Google Maps Street View and a Virtual Earth Bird's Eye view of the same location. You can choose between the various options of either map service, which means you can have the Google satellite view alongside Virtual Earth's Bird's Eye view or the satellite/aerial View in both maps etc.. This Google Map mashup will help you find the zip code for anywhere in the United States. Clicking on the map or keying a zip code or address into the search box will zoom the map to the area of that particular zip code. This post, looking at designers who have used the Google Maps API to present their portfolios, proved very popular. Again this was a post that benefited from a number of link backs from other websites. This post was also shared quite extensively on Twitter. This post back in February, looking at maps created in response to the Victoria bushfires in Australia, proved once again that in times of natural disasters there is a huge spike in search for maps on the Internet. 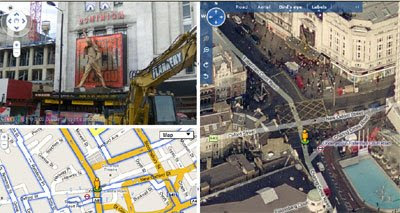 The rise of real-time search in 2009 seemed to be reflected in the popularity of this post that looked at some of the real-time maps created with the Google Maps API. The post looks at some of the Twitter maps created and the huge number of maps that now show real-time public transit traffic. 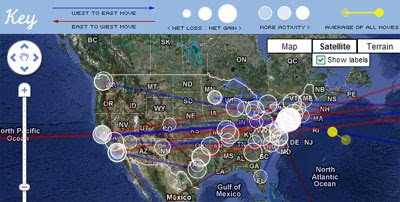 Jeral Poskey produced an amazing Google Earth browser plug-in tour of the crash of Flight 1549 that included audio from eight tapes released by the FAA. 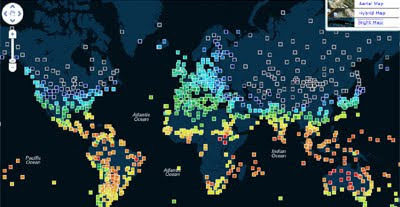 Global warming was never out of the news in 2009 and this post looking at maps that show the possible effects of sea level rises proved very popular. The video above shows a virtual cruise in Google Earth. The video shows the route of the 42 Night Cherry Cruise that sets sail from Australia and visits 18 ports in 11 countries. The Clean Cruising website also shows the route of the cruise on Google Maps. The map includes map markers for each day of the cruise. The markers include photographs and information for each of the ports on the cruise. The markers also include links to nearby photographs on Panoramio and videos from YouTube. Frank Taylor, of the Google Earth Blog, is currently sailing around the world on his boat Tahina. His website The Tahina Expedition, as you might expect from a renowned geo-blogger, features a great Google Map of his journey. The Tahina map shows Frank's planned route, his current position, his Tweeted positions, geo-tagged blog posts and trip logs. The map also includes the option to view the route via the Google Earth browser plug-in. Frank's blog also includes some great photographs and videos of his journey, 360 degree panoramas and underwater videos taken with a VideoRay ROV (Remote operated vehicle). Whilst on his journey Frank is also taking pictures using a kite aerial photography rig. Some of this imagery has already found its way onto Google Earth and Google Maps. If you want to take a look at these amazing close-ups on Google Maps then click here. The Wall Street Journal have produced a very nice visualisation of bank failures in the USA in the last two years, using Google Maps. 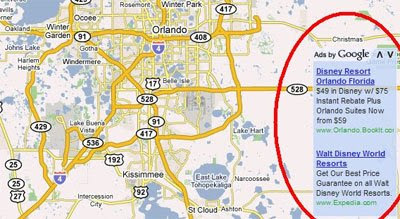 The size of the circles on the map represent the value of the bank's assets at the time of failure. The circles are interactive and, if you click on them, load information about the bank into the map sidebar. The map sidebar has a neat slider which you can use to view the bank's collapse over the last two years. The slider includes a 'play' button which will animate the failures over the two years. Under the map the data is presented in tabular form, with sortable column headers. Here is another nice little application built on Thor Mitchell's Street View with Driving Directions. Søren Johannessen has created a Street View driving directions route of the Alps that is accompanied by videos featuring the music of Kraftwerk. To start the Street View press 'Indlaes ruten' then press 'Drive'. Once you press 'Drive' the Street View will automatically follow a route through the Alps, accompanied by a Kraftwerk soundtrack. The route is the famous Alpe d'Huez ascent used in the Tour De France. One of my favourite examples in the Google Maps API Demo Gallery is Thor Mitchell's Street View with Driving Directions. The demo shows how to integrate Street View with driving directions. With Google's recent addition of oblique view to the Maps API it is now possible to synchronise the map view with the Street View direction. I've hacked Thor's example so that now as you play a driving route in Street View the map will rotate to face the direction that you are driving. This Google Maps mashup allows the user to browse for golf courses anywhere in the US. Anyone can add a golf course if it is missing from the directory or correct the information of an existing listing. Public golf courses are shown on the map with green map markers and private courses are shown with red markers. Each marker contains a link that takes you to the entry for that course in the directory. From the same map developer as 18HolesFinder comes this trail finder Google Maps mashup. 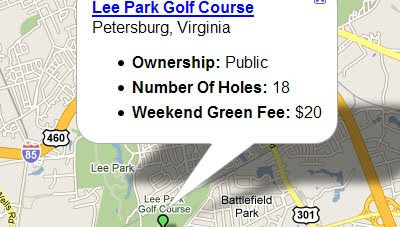 As with the golf course directory anyone can add a trail or edit the details of an existing listing in the directory. The difficulty of trails are indicated by the colour of the map marker on the map. Red markers indicate strenuous trails, yellow markers show intermediate trails and green markers show that the trail is fairly easy. ReThai uses the Google Maps API to show properties for sale or rent in Thailand. 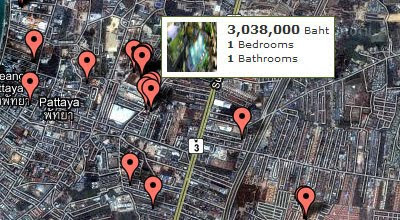 Anyone can advertise a property listing on the map for free by registering with the site. Real estate agents can even add a logo and business details to their properties added to ReThai. It is possible to search for properties on the map by price range, property type and location. Clicking on a property's map marker opens an information window with information about the listing and direct contact details of the property's owner. Soundtrckr is a social music application for smartphones and the web that, amongst other things, lets you geo-tag songs with Google Maps. The application allows you to share songs with your friends via the contacts on your smart phone and also allows you to share song information on Twitter and Facebook. Another smart feature of Soundtrckr is the ability to seed radio stations based on tracks or artists that you like. What's more you can even broadcast your created radio station to your friends directly from your phone. Guiness have released a new Google Earth browser plugin game that requires players to terraform planets. The object of the game is to create 'mountainous', 'plains' and 'vegetation' regions on a planet and then search for water droplets in your terraformed regions. When you have collected enough water a pint of Guiness is created on your planet. If you find the pint of Guiness you have the chance of winning a crate of Guiness or even a lifetime's supply. You can invite your friends to your created planet via Facebook Connect and searching together you have a higher chance to win that life time supply of stout. If you like this you might also like Monopoly City Streets. As I write there is a blizzard blowing and lots of lovely virgin snow building up outside my home in London. 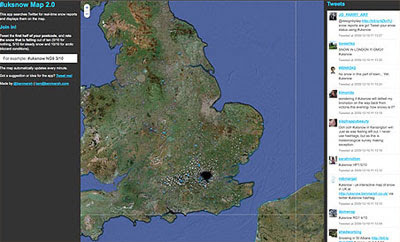 Thanks to this Google Maps mashup I can see that this is also true for most of eastern England. Will it Rain Today? is a near real-time weather map for the UK. The map animates radar data for the last half hour showing where rain (or snow) is falling. The map uses different colours to show where rain, snow and freezing rain are falling across the UK. You can see how much is falling by the intensity of the colour. This Google Maps mashup uses the new geo-tagging feature in Twitter to create a journey map from messages you have posted to Twitter. In fact you can create a journey map for any geo-tagged enabled Twitter account by just entering any Twitter member's user name. To create a map you need to enable geotagging under 'Settings' in your Twitter account. TweetJourney scans the last 100 tweets in any selected account and maps all of the geotagged tweets. From the generated list you can remove any tweet that you don't want to show up on your map. When you enter your Twitter user name all you have to do is press "Let's go - show journey" and a map is created for you. Twitter journey creates a unique URL for each map so you can easily share the map with your friends on Twitter, Facebook or even by e-mail. 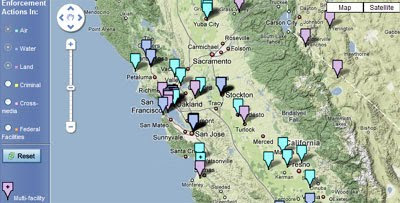 If you don't have enough geo-tagged tweets you can test the map by using TwitterJourney's own Twitter account '@fdqps'. John Kessler, food critic at accessAtlanta.com, decided to visit 30 restaurants in Atlanta in November. 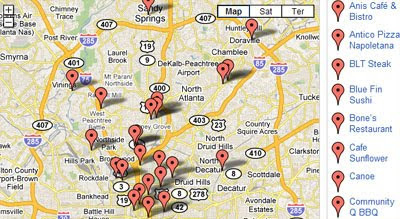 To illustrate the resulting reviews of each establishment accessAtlanta.com has produced a Google Map showing the location of each of the restaurants. Each restaurant tagged on the map contains a brief introduction and an address and phone number. The information window for each restaurant also contains a link to John's review of the restaurant on the website. Hot on the heels of yesterday's relaunch of the #UKSnow map comes this Dutch snow map. 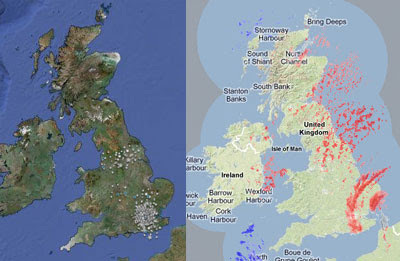 Just like the #UKSnow map Mobypicture's map plots the latest tweets to mention snow. 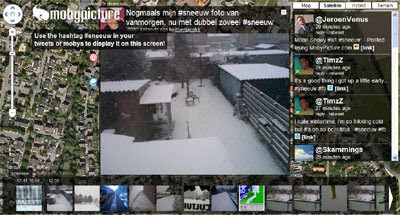 To add yourself to the map you just need to use the hashtag #sneeuw in your tweets or mobys. 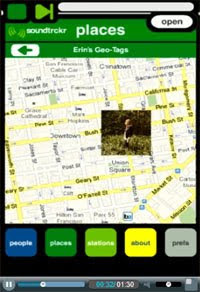 Mobypicture allows users to share their photographs on a Google Map. This means that the Mobypicture's Sneeuw Map contains lots of lovely pictures of all the snow that has fallen in the Netherlands over the last couple of days. Blomap is a social network and location sharing website built on top of Google Maps. Registered Blomap members have their own Blomap Space where they can add favourite locations to a personal map. Visitors to Blomap can browse a global map of all the user added locations and the individual blogs. Members can also post and share reviews, events, photos and audio about their favourite locations and decide to whom they want to share their information. Blomap allows users to filter all the content they post, allowing access to everyone or just friends. Sometimes map developers using the Google Maps API come up with a feature so clever that Google themselves end up implementing something very similar on Google Maps itself. That curse has now fallen on RouteGuru. In India many streets don't have names, which of course can make giving driving directions pretty confusing. To overcome this problem RouteGuru devised a solution which they called 'landmark based' directions. A typical route in RouteGuru will say something like "take the left after restaurant X, pass by theatre Y on the right..etc.". Guess what today Google have launched a 'landmark' system for driving directions on Google Maps in India. Google are using a new algorithm to determine which landmarks are most useful for navigation, based on importance and closeness to the turns that you need to make. They then include these landmarks in driving directions. This new development will greatly improve driving directions for Indian users of Google Maps. It probably won't have such a positive impact on RouteGuru's traffic. However, in Google's defence, the use of landmarks when giving directions in India is very common. Google have made some cool updates to the Maps Data API. One of the new features is geospatial and attribute search. The search allows you to select features on a map according to different criteria. Currently, the Maps Data API supports spatial search (search over an area of the map) as well as attribute search (search over the attributes of features of the map). Google have provided an example College Finder map that uses the new geospatial and attribute search. The map pulls in data from a Google My Map consisting of approximately 3000 U.S. 4-year colleges. Using the geospatial and attribute search you can search the map by location and / or by attribute (in this case either 'public' or 'private' colleges). Animal Finders in Oxford, UK provides a service for people to report lost and found animals in the Oxford area. These reports can be seen on a Google Map and are also distributed via email and SMS to key organisations plus members of the Local Pet Watch scheme in the Oxford area. Owners of missing animals can use Animal Finders as a one-stop-shop for spreading the word in a fast and efficient way. 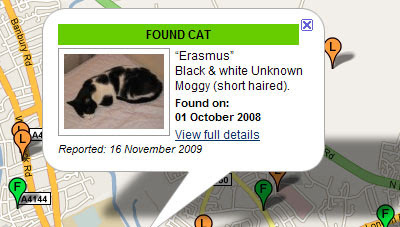 The Animal Finders system also automatically creates a poster for each and every missing animal reported which you can then display around your neighbourhood. The map uses a simple marker system, 'L' markers represent lost animals, 'F' markers indicate found pets and 'S' shows animals that have been stolen. Ben Marsh has updated his #UKSnow map just in time to capture a flurry of snow in the UK today. If you live in the UK you can add to this Google Map simply by tweeting the first half of your postcode and a score out of 10 for the snow in your location. The map updates to show the results every minute. The Guardian has also reported on #UKSnow today. This has had the unfortunate effect of putting a lot of pressure on the #UKSnow servers - so be warned you might have problems viewing the page today. New York City Parks and Recreation Online (NYCPRO) is a Google Maps mashup that lets you discover parks and recreational opportunities in New York City. You can search for parks by neighborhood, as well as limit your search to certain recreational activities. You can also locate other amenities on the map, such as bike shops, restaurants, hospitals, landmarks, or lodging with the map search, and you can locate multi-use trails in the city. The map is an entry into the NYC Big Apps Competition. Voting for which began yesterday. Website Mediaite are holding an interesting census, with the help of Google Maps, to track their readers' movements since the beginning of the 21st Century. To add yourself to the map you just need to enter the city where you lived in 2000, and where you live now. Red lines on the map indicate moves from east to west and blue show the opposite. The icons over cities scale depending on whether people moved to or from them, and grow more opaque with the more moves in and out. On the map you can scroll over each line to see the reason for a person’s move. I you live in Honolulu then I'm afraid your chances of a white Christmas are zero. In fact if you want to see a little snow then you should move to Bismark in North Dakota where the odds are fairly even that Santa will need a sleigh come Christmas Eve. To explore the odds of a white Christmas elsewhere then you will need to check out Community Walk's White Christmas Map. Odds for the map are provided by the Book of Odds. The government of Venezuela is apparently a little wary of publishing crime statistics therefore QuieroPaz.org have decided to create their own Google Maps mashup to show crime and armed attacks in the country. The site is updated continuously from information on abductions, killings and attacks reported in newspapers. The site uses a number of different map markers to indicate the type of crime committed. Boeing's new aircraft, the 787 Dreamliner, will today take its very first flight. Boeing's website Boeing's New Airplane is hosting a live webcast of the event and have produced a Google Map that will track the plane's flight in real-time. The Dreamliner is due to take off at 10 am (PST) (18:00 GMT). At the time of writing the map shows the Dreamliner parked directly on the runway at Paine Field, Seattle. The map includes indicators that will show the plane's speed and altitude whilst in flight. Flight data for the map is provided by FlyteComm,Inc. The Dreamliner's location will be updated on the map once a minute. 2009 has been another busy year for the Google Maps team. The Google Maps API finally came out of 'beta', Street View imagery continued to be added to new countries around the world and new layers were added to Google Maps. The biggest news of the year was probably the release of Google Maps Navigation (Beta) for Android 2.0 devices. Google Maps Navigation comes with everything you'd expect to find in a GPS navigation system, like 3D views, turn-by-turn voice guidance and automatic rerouting. In December Google released 'Aerial View' in the Google Maps API. Aerial View is very similar to Bing Maps' Bird's Eye View. Whilst Aerial View is only available in the Google Maps API for now, I'm fairly sure it will graduate to the Google Maps site in 2010. In January Google added bathymetry imagery to Google Earth and Google Maps. Also in January Google added a new 'Transit' layer. The Transit Layer overlays public transit lines on Google Maps. Think of a virtual metro map on top of Google Maps. In February Google launched Google Latitude. 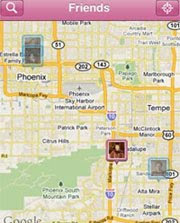 Latitude is a mobile phone map tool that allows users to track friends and family in real-time. In February Google also allowed Google Maps API users to start adding the new Google Maps UI controls. On the main Google Maps page Google started adding many more local searches. Until February Google Maps only plotted the first page of business results, now Google Maps plots hundreds more of local search results as small circles. Google also launched My Tracks. My Tracks is an application for Android-powered phones that uses a phone's built-in GPS to record your trails. Using the application it is possible to visualise and share recorded trails on Google Maps. In March Google released Street View imagery for the first time in the UK. The Google Maps API team released a new GoogleBar control in the Maps API to allow users to search maps for local businesses, landmarks and points of interest. Map developers can use the map control to monetise their maps via advertising targeted to the user's searches in the results. In March, a few years after its first release, the Google Maps API came out of 'beta'. The main Google Maps site started adding Google My Maps and kml's to Google search results in Google Maps. 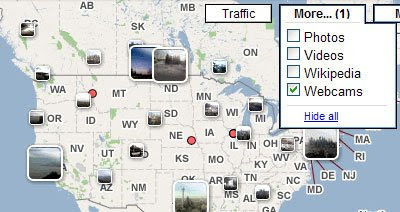 In April a new webcams layer was added to Google Maps. Google added a couple of new options in driving directions on Google Maps. The first allows you to save your finished directions as a Google My Map. This makes it easy to share your driving directions with friends. A new tool called 'Draw a line along roads' was also added. With this tool when you drag a line it should snap automatically to follow the line of the roads on the map. Google also launched a Mapplets API Demo Gallery and a full-screen option for Google Maps Street View. 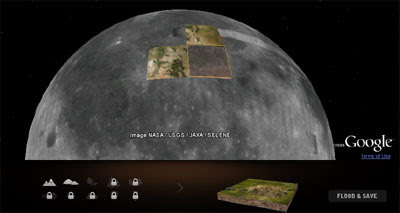 In March the Google Earth Browser plugin gained a number of new features. The new features mean it is now possible to explore the world's oceans underwater, record and play back narrated tours, view historical imagery, and explore Mars in 3D directly from the browser. In May Google released Google Maps API v3. The main features of the new release are faster rendering of maps, better implementation of maps on mobile devices and better geo-coding. In May Google also announced the release of the Maps Ad Unit. The Google Maps Ad Unit is a new way for Google Maps API developers to monetise their Google Maps mashups. The ad units update with geographically relevant ads as the user pans the map. May also saw the introduction of the Google Maps Data API. The Google Maps Data API allows client applications to view, store and update map data in the form of Google Data API feeds using a data model of features (placemarks, lines and shapes) and maps (collections of features). The Google Maps Data API also provides free hosting and bandwidth for your map data. The geodata is available across platforms; web, mobile phone, 3D applications, or even command lines. Geodata from the Google Maps Data API can be instantly indexed and made searchable in Google Maps. Google added a new feature to the right-click menu on Google Maps. The new feature, 'What's here? ', when clicked, gives you the most relevant results representing a location, whether it's a specific address, a natural entity, or a place name. In June Google also launched Google City Tours. The application allows anyone to identify points of interest and plan multi-day trips in major cities. Users specify the location of their hotel and the length of their trip and City Tours maps out an itinerary. Google also added voice search to Google Maps on Android phones. 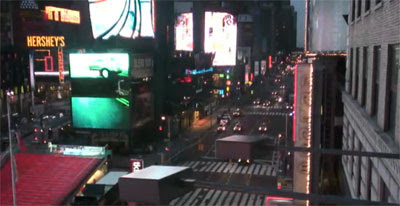 In Street View Google added a layer to view user photographs and some new navigational tools. 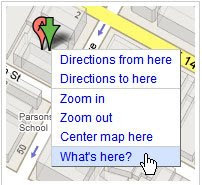 The navigational tools add rectangular overlays on top of Street View that when double clicked zoom you into the view. There are also round overlays that let you jump down a street and other rectangular overlays that let you jump down a street and pan to a particular view.